BRUSSELS — Talks on a proposed U.S. ban on laptops and tablets in flights from Europe ended Wednesday with no ban — and a promise of more talks and better intelligence sharing. For days now, European Union officials have been hoping for details on the threat that prompted the proposed ban — the same details that U.S. President Donald Trump discussed with Russian diplomats at the White House last week. The airline industry came out against the proposal in a strongly worded letter that said it would cause a severe downturn in trans-Atlantic air travel and cost travelers more than a billion dollars in lost time. On Wednesday, in a secure room in Brussels, officials from the U.S. Department of Homeland Security and the European Union swapped information about threats involving air travel. An official who followed the talks said the ban was "off the table" for now. He spoke on condition of anonymity to release details of the sensitive negotiations. They also shared details about their aviation security standards and detection capabilities, and agreed to meet again in Washington next week "to further assess shared risks and solutions for protecting airline passengers, whilst ensuring the smooth functioning of global air travel," according to a joint statement. The White House has defended Trump's decision to share classified information involving an Islamic State group terror threat related to the use of laptops on aircraft with the Russian foreign minister and Russian ambassador. The proposed electronics ban would create logistical chaos on the world's busiest air travel corridor — as many as 65 million people a year travel between Europe and North America on nearly 400 daily flights, many of them business travelers who rely on the devices to work during flight. Such a ban would dwarf in size the current one, which was put in place in March and affects about 50 flights a day from 10 cities, mostly in the Middle East. The International Air Transport Association, or IATA, which represents 265 airlines, wrote to both the EU and the U.S. State Department on Tuesday to oppose the proposed ban, which it said would deeply affect the economy and cause the equivalent of $1.1 billion in lost time to passengers. There is also the question of the relative safety of keeping a large number of electronics with lithium batteries, which have been known to catch fire, in the cargo area. IATA proposed more in-depth pre-flight screening rather than forcing passengers to give up their electronics. On Wednesday, it welcomed more discussions on how to improve security while minimizing travel inconveniences. Nonetheless, airlines have said it is merely a matter of time before the ban is put in place. The prospect has alarmed EU officials, who want to know more about any new threats and the disruption such a move would create. Experts say a bomb in the cabin would be easier to make and require less explosive force than one in the cargo hold. 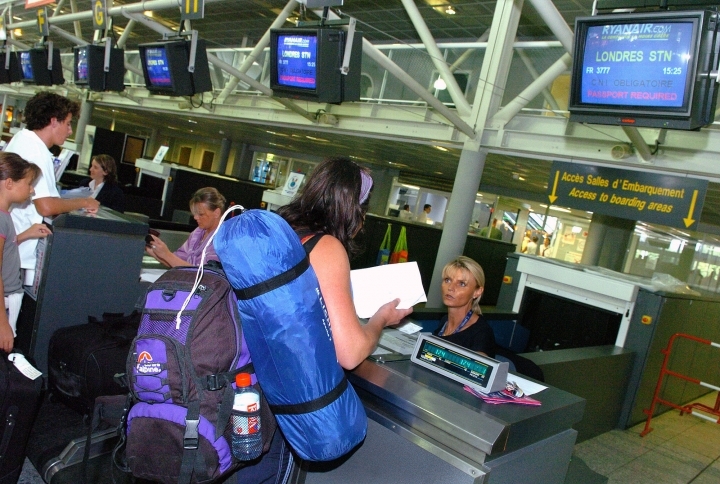 In addition, baggage in cargo usually goes through a more sophisticated screening process than carry-on bags. The original ban on mostly Middle Eastern flights, which Britain also partially adopted and is being considered by Australia, focused on certain countries because their equipment to screen carry-on bags is not as effective as machines in the U.S., analysts say. Officials from Homeland Security met last week with high-ranking executives of the three leading U.S. airlines — American, Delta and United — and the industry's leading U.S. trade group to discuss expanding the laptop policy to flights arriving from Europe. The initial ban has hit Middle Eastern airlines hardest. Emirates, the Middle East's largest airline, this month cited the ban as one of the reasons for an 80 percent drop in profits last year. It said the ban had a direct impact on demand for air travel into the U.S. and it faced rising costs from introducing complimentary laptop loans to some passengers. Hinnant reported from Paris. Associated Press writer Ken Guggenheim in Washington contributed to this report.